Partial anomalous pulmonary venous connection (PAPVC) is a rare entity. Only 10% of these are left sided. An intact atrial septum is further uncommon. International Journal of Surgery Case Reports presents the case of a 7 year old boy who presented with effort intolerance and no cyanosis. Clinical examination was unremarkable. Doppler echocardiography revealed left sided pulmonary veins opening into left innominate vein. Right pulmonary veins were seen draining normally into the left atrium. There was no ASD and right atrium and right ventricle were dilated. CTPA aided in defining the anatomy. 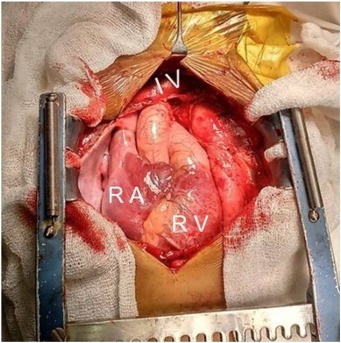 Left pulmonary veins were shown to be joining to form a common channel and draining into superior vena cava via left brachiocephalic vein suggestive of left supracardiac PAPVC thus confirming the preliminary diagnosis of isolated left sided PAPVC. Pt. was successfully surgically managed. Median sternotomy approach was chosen. 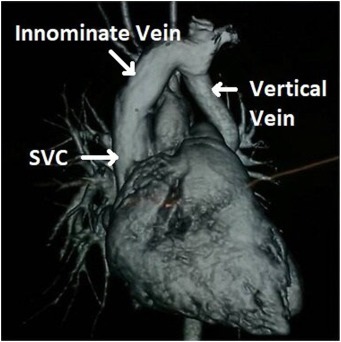 Innominate vein and superior vena cava were found to be dilated. Also, the right atrium and the right ventricle were dilated. Vertical vein was seen opening into innominate vein. 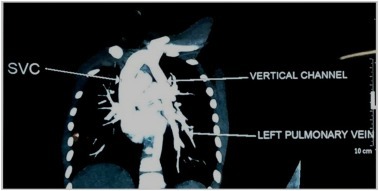 Left Pulmonary veins were seen opening into the vertical vein. Patient was operated without cardiopulmonary bypass (CPB) support. A 15 mm opening was made in the common chamber horizontally after applying a Cooley’s clamp. Another opening of similar dimension made over LA appendage. Vertical vein was anastomosed to left atrial appendage posteriorly with 6-0 prolene in side-to-side fashion. The vertical vein-innominate confluence was ligated at the end of the procedure. Chest was closed in standard fashion. Mechanical ventilation was required for 12 hours. Patient recovered uneventfully and was discharged on Day 10.